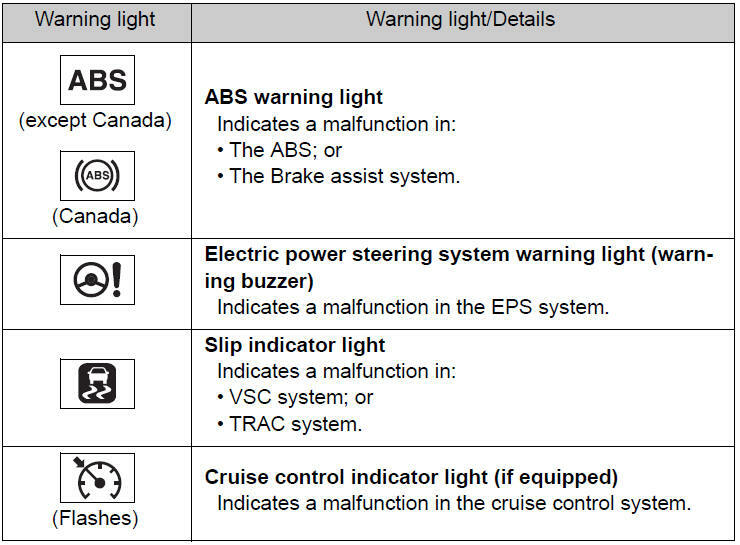 The following warnings indicate a possible problem in the brake system. Immediately stop the vehicle in a safe place and contact your Toyota dealer. *: Parking brake engaged warning buzzer: The buzzer sounds to indicate that the parking brake is still engaged (with the vehicle having reached a speed of 3 mph [5 km/h]). Failure to investigate the cause of the following warnings may lead to the system operating abnormally and possibly cause an accident. Have the vehicle inspected by your Toyota dealer immediately. After taking the specified steps to correct the suspected problem, check that the warning light goes off. *1: Open door warning buzzer: A buzzer will sound if the vehicle reaches a speed of 3 mph (5 km/h) or more with any door open. *2: Driver’s and front passenger’s seat belt buzzer: The driver’s and front passenger’s seat belt buzzer sounds to alert the driver and front passenger that their seat belt is not fastened. Once the engine switch is turned to the “ON” or “START” position, the buzzer sounds for 6 seconds. The buzzer sounds once if the driver’s or front passenger’s seat belt is unfastened when the vehicle reaches a speed of 12 mph (20 km/h). Then, if the seat belt is still unfastened after 30 seconds elapse, the buzzer will sound intermittently for approximately 10 seconds, followed by a different tone for approximately 20 more seconds. 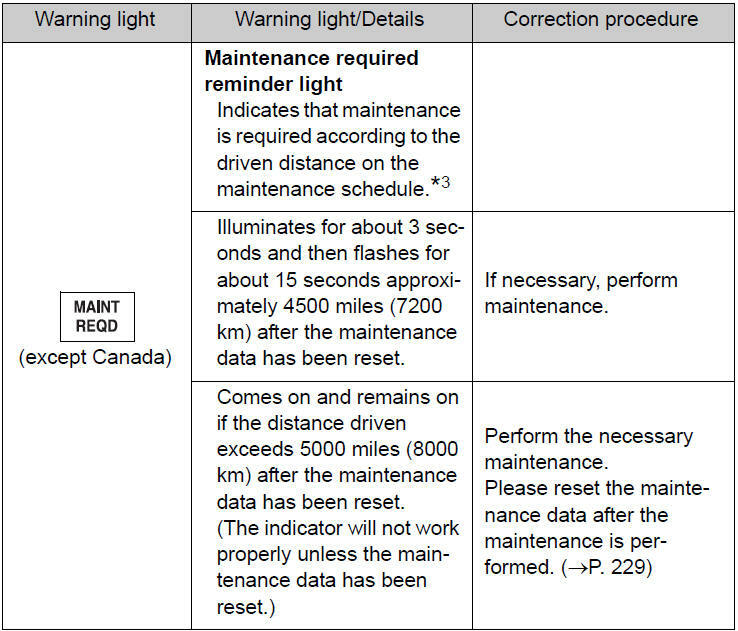 *3: Refer to the separate “Scheduled Maintenance Guide” or “Owner’s Manual Supplement” for the maintenance interval applicable to your vehicle. ●Is the fuel tank empty? If it is, fill the fuel tank immediately. 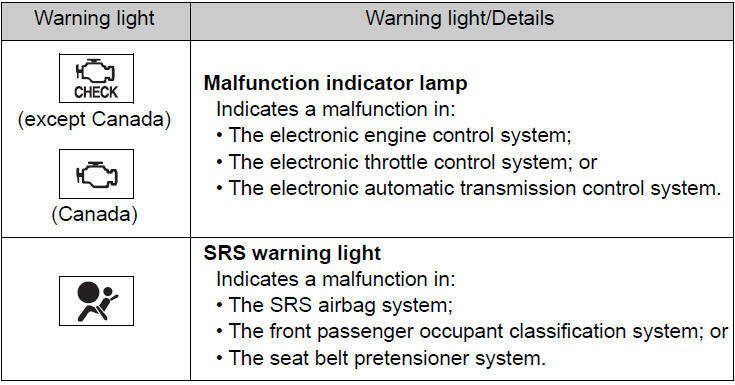 The malfunction indicator lamp will go off after several driving trips. If the malfunction indicator lamp does not go off even after several trips, contact your Toyota dealer as soon as possible. The tire pressure warning light may come on due to natural causes such as natural air leaks and tire inflation pressure changes caused by temperature. In this case, adjusting the tire inflation pressure will turn off the warning light (after a few minutes). The compact spare tire is not equipped with a tire pressure warning valve and transmitter. If a tire goes flat, the tire pressure warning light will not turn off even though the flat tire has been replaced with the spare tire. Replace the spare tire with the repaired tire and adjust the tire inflation pressure. The tire pressure warning light will go off after a few minutes. 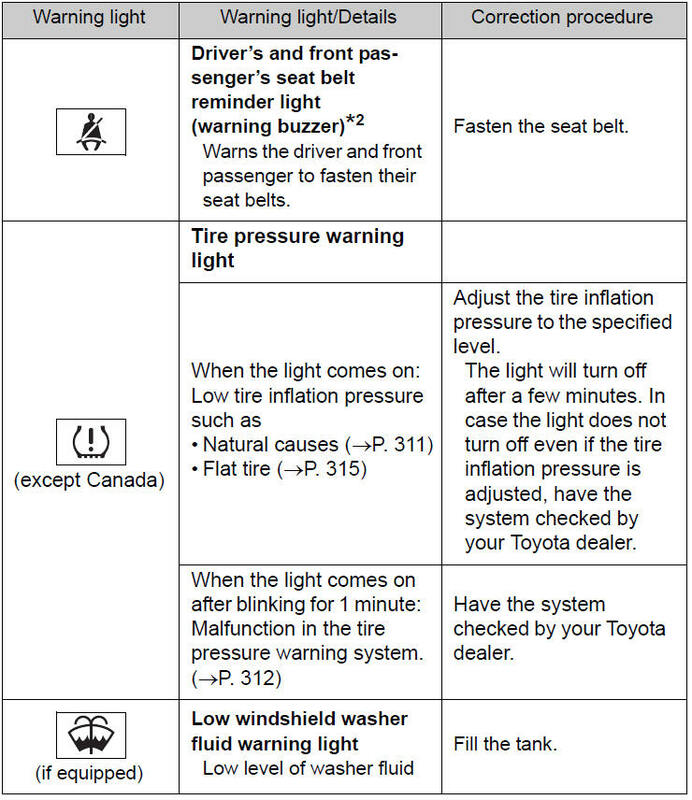 If the tire pressure warning light frequently comes on after blinking for 1 minute when the engine switch is turned to the “ON” position, have it checked by your Toyota dealer. The vehicle speed linked seat belt reminder buzzer can be disabled. (Customizable features →P. 368) However, Toyota recommends that the seat belt reminder buzzer be operational to alert the driver and front passenger when seat belts are not fastened. The steering wheel may become extremely heavy. If the steering wheel becomes heavier than usual when operating, hold firmly and operate using more force than usual. ●If the tire pressure warning light comes on even after tire inflation pressure adjustment, it is probable that you have a flat tire. Check the tires. If a tire is flat, change it with the spare tire and have the flat tire repaired by the nearest Toyota dealer. As an added safety feature, your vehicle has been equipped with a tire pressure monitoring system (TPMS-tire pressure warning system) that illuminates a low tire pressure telltale (tire pressure warning light) when one or more of your tires is significantly under-inflated. Accordingly, when the low tire pressure telltale (tire pressure warning light) illuminates, you should stop and check your tires as soon as possible, and inflate them to the proper pressure. Driving on a significantly underinflated tire causes the tire to overheat and can lead to tire failure. Under-inflation also reduces fuel efficiency and tire tread life, and may affect the vehicle’s handling and stopping ability. Your vehicle has also been equipped with a TPMS (tire pressure warning system) malfunction indicator to indicate when the system is not operating properly. The TPMS (tire pressure warning system) malfunction indicator is combined with the low tire pressure telltale (tire pressure warning light). When the system detects a malfunction, the telltale will flash for approximately one minute and then remain continuously illuminated. This sequence will continue upon subsequent vehicle start-ups as long as the malfunction exists. When the malfunction indicator is illuminated, the system may not be able to detect or signal low tire pressure as intended. TPMS (tire pressure warning system) malfunctions may occur for a variety of reasons, including the installation of replacement or alternate tires or wheels on the vehicle that prevent the TPMS (tire pressure warning system) from functioning properly. Always check the TPMS (tire pressure warning system) malfunction telltale after replacing one or more tires or wheels on your vehicle to ensure that the replacement or alternate tires and wheels allow the TPMS (tire pressure warning system) to continue to function properly.